Chu Qiao was known as Agent 005 within the Secret Service’s 11th Division in her former life. She was locked up in the Secret Service’s prison as she was framed. After she successfully broke out from prison, she sacrificed her life bravely to preserve the Secret Service by defusing a bomb meant to wipe them out. After her demise, she was magically transported back in time to the Xia Dynasty to start a new life, where she assumed the identity of an 8-year-old female servant. In order to help Yan Xun, the Prince of Yan Bei, escape, she lived in the imperial palace for eight years along with him. In the process, they helped each other to become stronger such that they could rebel against the Xia Empire and return to the territory of Yan Bei. The first half of the novel depicts vividly how the two characters go through thick and thin, hand in hand – Chu Qiao helping Yan Xun to achieve his dreams and Yan Xun’s love towards Chu Qiao. However, the two of them start to drift apart due to their conflicting personalities – Chu Qiao having a kind hearted nature and Yan Xun having the airs of a prince: arrogant and boisterous. Chu Qiao eventually leaves Yan Xun and ends up together with Zhuge Yue, who had always fancied her all along. The two of them eventually become recognised as the famous Queen of Beauty and the King of the Green Sea, establishing a prosperous, long-standing and stable dynasty. The old monarchy system was undoubtedly and easily scrapped; the new Xia Empire, helmed by the two of them, rose from the verge of its downfall like a phoenix from the ashes! This story was heartwrenchingly sad - broke my heart and made me cry like a baby. The end was just so bittersweet. I've been running out of novels with female protagonists so I decided to give this a try. Through the first 3 chapters we see how the main female MC in her first life is truly a talented and dedicated agent who died for the greater good. When she finally begins her second life as the 8 year old slave, it was really hard to churn. I mean, waking up as a slave is already some high difficulty setting, but waking up to wolves is another thing. Some names that were mentioned... more>> in the summary made their appearance but it's very difficult to like any of them so far. It's still at 5 chapters, but the translation is good and the story has a very strong female MC. I'll be waiting patiently for more! I was blown away by the blockbuster 2017 tv drama, Princess Agents. The amazing fight scenes with Zanilla Zhao, the graphic violence/cruelty in a slave-owning aristocratic society, and the inherent power of a lowly slave girl with heart and strength who is true to her friends - made a lasting impression on me. It was very different from the other female protagonist chinese historical dramas I had seen. I loved it. Sueleesunshine's blog translations of the engagement and marriage chapters!!!! although there is there is blood, war and betrayal by others, the hero lives and becomes the king of another country, she marries him, they take over the world and live happily ever after. The description above says, "The two of them eventually become recognised as the famous Queen of Beauty and the King of the Green Sea, establishing a prosperous, long-standing and stable dynasty." Happy ending. Perfect. A friend read the entire book in hard copy in Chinese, and said it was excellent. The drama and book are different, as there are restrictions on historical dramas aired on Chinese TV. For example, although the novel heroine is a transmigrated special ops women who wakes in the body of an 8 year old, who then ends up living with the Prince of Yan Bei for 8 years in his exiled state, in the drama Zanilla Zhao is a young girl with superhuman abilities from her secret sect mother and early childhood assassin training, and only lives with the Prince of Yan Bei for 3 years. Etc. I haven't yet read the new (started May 2018) chapter-by-chapter translations by Qidian International listed here, but I love the drama, the story that I know piecemeal so far, and I hope their translation is good. So far, they have up to chapters 243 on their website (although it's not updated on novel updates), and you have to either watch an ad, or pay with "stones" (you earn them by checking in on the website regularly) to view the hidden chapters. I'll update this once I've read their translation. Zanilla Zhao, Kenny Lin and Shawn Dou were amazing in Princess Agents, and like many other fans, I secretly hope they come back to film the second half of the novel! Story is pretty good, albeit dark. There are discrepancies in the plot that happeneds several times, usually during major turning points in the story. Long story short, FL has a severe case of Stockholm Syndrome. as a soldier and a communist officer, our main were a straightforward and stubborn type till her dream got ruined by the people she trust most. When the good people killed by their comrades, the disciple ordered soldiers to kill his teachers,... more>> the soldiers killed their own people, her beliefs slowly bend. The usual premise of a skilled woman being transmigrated into another world and into a weak body. However, I enjoyed the initial chapters after her arrival. They paint a grim picture of a foreboding story of blood, tears and revenge. The MC is decisive and almost fatalistic in her outlook, she adapted quickly to her new environment and aren't afraid of staining her hands with murder and promised to get her vengeance on the nobles. Decent start, looking forward for more. 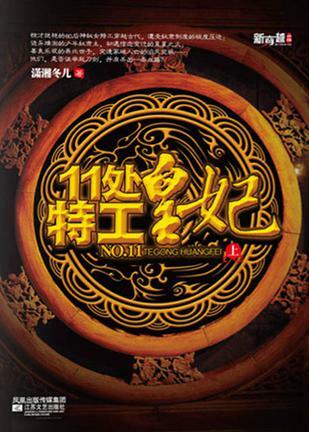 I first discover this a year ago though I was reluctant to read it back then, a week before now I watched the adaptation drama frustrated by the ending, then by searching I realized that The Legend of Chu Qiao: Division 11's Princess Agent was indeed the novel version of the the drama. So I rated this novel 5/5. Why? Even though this novel is full of drama and makes my heart aches, the author did a good job portraying each characters to the best they can be, (I also... more>> salute the translators of this novel a big thanks for them). All I can say is that this novel is truly epic! The storytelling is amazing, well thought out and each major character has so much depth. You'll definitely lose out if you don't read it! I first saw the drama that was made for this novel but I'm so happy that I read the novel after. The novel is way better than the drama. This novel is a slow placed one, especially with the the romance but it's so worth it. Everything is so well written that you'll get sucked in the plot and the characters battles with what they have to do and what they desire that you will not be able to put it down. The romance is a slow one but it's worth when you get to the part when Chu Qiao (MC) finds out that Zhuge Yue (ML) is alive, that's when the true story of these two starts.